Reuse Potential | SAVE the BELL! 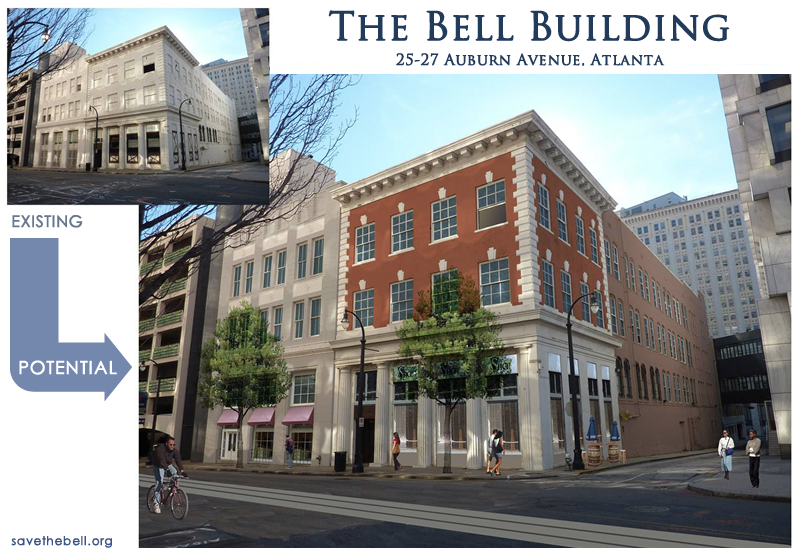 This rendering shows what the Bell could look like as an adaptive reuse project. Zoning for this Downtown district allows the building to be used for a number of purposes, including residential, office and retail. The benefits of activating this property with any of these uses would be great. Old structures like this add authenticity to city streets; studies even show that they make streets more inviting to pedestrians. With the building’s face on Auburn Avenue alongside the streetcar route, this is a perfect opportunity to allow the streetcar to enable investment in blighted buildings. Our concern here is in losing a key part of the urban fabric in Downtown Atlanta, where too many structures from our history have been lost. This building was engineered to be strong enough for vertical expansion, providing potential for an adaptive reuse project that would compliment other projects nearby such as the Atlanta Daily World building (once slated for demolition, now apartments and shops), the Flatiron Building (currently undergoing renovation), the Candler Building (set to become either hotel or residences), and the Olympia Building (undergoing a major restoration project, to become a Walgreens).